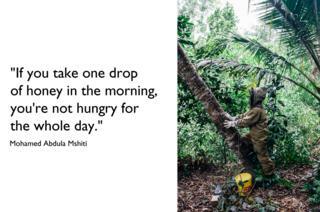 Photographer Jurre Rompa spent the first three months of 2018 exploring the tropical forests of the Zanzibar archipelago. 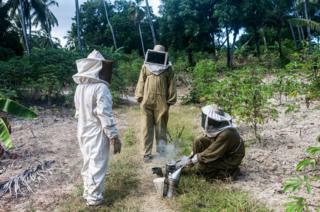 While travelling across Zanzibar and Pemba and with the help of NGO's including Community Forests International and Barefoot, Mr Rompa photographed a group of local beekeepers who have placed their hives among the verdant forests. The pair of islands make up a semi-autonomous territory around 30 miles off the coast of the Tanzania. The indigenous forests have suffered because of intensive farming to produce the spices for which the islands are famous. Much of the islands have been stripped, leaving only a thin layer of fertile soil. Several programmes are currently in place to replant the forests. 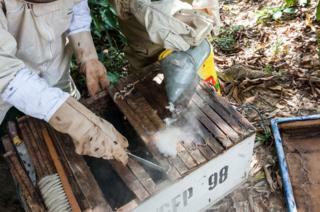 Bees, with their ability to pollinate the plants, are an essential part of the reforestation process. 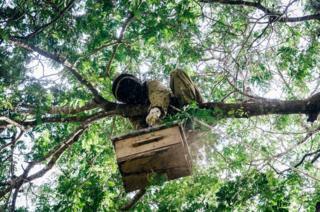 Alongside their contribution to the local biodiversity, bees offer the islanders a way to boost their incomes through selling the honey. 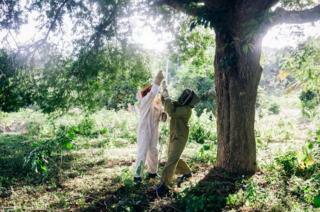 They provide a new source of income for the smallholder farmers, who have been affected by a decline in the price of clove, a spice traditionally grown on the island. Ali Manguja, aged 60, is a cow farmer and runs a plant nursery. 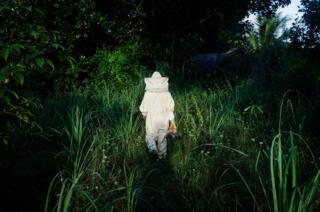 He has kept bees since he was a child, and uses the income that the honey brings in to pay for the water for his nursery. The extra money also comes in handy to provide for his 11 children. He told Mr Rompa that he will "do this until God wants me to stop and I can't do it any more". 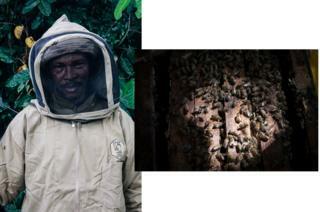 Mohamed Abdula Mshiti, 57, is another man who has turned to beekeeping for extra income. He worked as a farmer for more than 30 years, and also as a poultry keeper and an irrigation engineer. 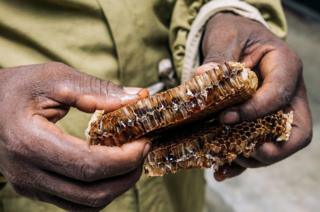 "Honey on Pemba is expensive and hard to get," he explains. "One litre is 24, 000 Tanzanian shilling (£8; $10.5). We use honey for eating but also as a medicine. 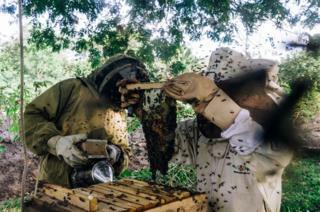 "If you take one drop of honey in the morning, you're not hungry for the whole day."